Product description: Shannon O’Hara’s first book stuns readers by casually demystifying the world of spirits, ghosts, entities, channels and the world of a little girl who just doesn’t fit in. Shannon dispels the seriousness and significance so often attached to the subject and makes it accessible with her honest accounts of the different ways spirits can play a part in our lives. Vulnerable, compelling and empowering Talk To The Entities sets a whole a new standard for books of its kind and will continue to inspire a different way of seeing the world now and in the future. Discover and access what else is possible within these pages. This is a 159 page eBook. Product description: This is beginning of digging deep, getting thorough and getting those demons out of your life! Believe it or not many people do have lots and lots of demons. This is not to be scared of, rather recognized, so we know what to target for change. 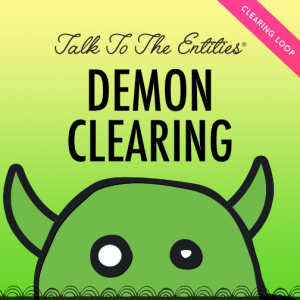 Demons are a taboo subject and can bring fear, while it is true that demons can be quite treacherous, it is also TRUE that demons can be cleared. This audio will be fantastic for you guys that have been aware of and have any suspicions that you have demons or are living with people that have demons in their life. This product is an audio file that is designed to be listened to repeatedly on a loop until desired effect is achieved. Product description: This audio is designed to be played in your home. Will clear all entities and all energies that are haunting or creating disruption in any house, building, structure, even property or land. Please listen to the audio Intro for instructions on clearing land. This product is an audio file that is designed to be played repeatedly on a loop until desired result is achieved. Product description: Shannon will put you back into connection with the beautiful, magical spirits of the Earth. These spirits are vital to the health and wellbeing of our planet! This loop will create having these spirits more in our life and inviting them to participate in the creation of a healthy and thriving Earth. Your animals and children will LOVE this audio! 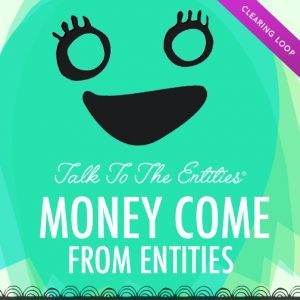 Product description: Who would love to have assistance from entities to bring you MONEY!? These clearings will go very deep into your systems to remove what prevents you from receiving with ease. We will establish the willingness to work with the energies of the universe to bring more wealth, money and receiving into your life and be open to entities helping us out. Because they will if you will receive! This product is an audio file that is designed to be listened to repeatedly on a loop.